I did a post just before Valentine’s Day about how “Love” titles were in the air, which included songs by Cher Lloyd and Maroon 5. Well, it’s not just them now! The big day may by over, but any day is good to spread some “Love”. So, here are two more songs that are looking to find a mate, that being mainstream radio. Get ready to shake a little to these super slick singles. This collaboration is as good as Gould. Calvin Harris is climbing all over the globe on the national charts. His latest offering in the States, “Sweet Nothing”, with Florence Welch, remains in the top ten in airplay. However, Harris is moving onto a new single from his album, 18 Months, which was released last year. 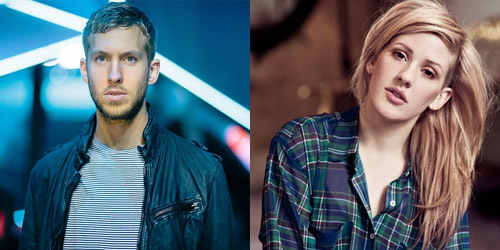 The fourth U.S. single from it is officially “I Need Your Love”, with vocals by British singer Ellie Goulding. It’s a fan favorite. It’s already been a top-20 hit in New Zealand based on download sales alone, earning a Gold certification. It’s also had some minor chartings in other countries, though it will see a wider release starting next month. You may remember that Goulding had a slow rise to the top on the U.S. charts last year after a rerelease of her single, “Lights”. For some reason, it managed to catch on here while it generally flopped in Europe as it was the sixth release from her last album. It was the first (and only) radio single here. She released Halcyon in 2012, which launched one single at CHR radio, “Anything Could Happen”, missing the top 20 despite a lot of television placement including an advertisement for Beats By Dre headphones. It was also performed by Fifth Harmony two times on the X Factor. (They, like the song, weren’t a winner.) It wasn’t the most commercial-sounding thing, but I thought it would see some more action coming off a huge single. “Need”, on first listen, definitely has bigger things ahead of it. It’s a typical Harris beat, but it’s a really excellent one, and Goulding’s vocals match perfectly with it. Plus, it’s good to hear a little bit of piano and guitar mixed in with the EDM nature of it. There’s nothing especially interesting about the lyrics; it’s just about a girl who pleads, yet questions about the love from her significant other. She sings, “Am I dreaming? Will I ever find you now?/I walk in circles, but I’ll never figure out/What I mean to you, do I belong?/I try to fight this, but I know I’m not that strong.” Her distinct vocals really set her apart from other singers on the scene today; question is, will radio bite at her material again? Will it be another elongated rise and peak this fall? We’ll find out as it goes to radio in 2 1/2 weeks. Will the Lotus finally rise to the occasion? “Just A Fool” may have been another dud from this little lady’s Lotus, but her record label isn’t stopping at two releases. It’s surprising given the underperformance of both singles and the effort itself, but I guess they are fully intent on getting a big hit. “Let” has been rumored to be a third single from the album for several weeks now after an add in early February by radio station B96 in Chicago, one of the top CHR stations in the nation. It then entered Billboard’s Dance/Club Play Chart. Now, a disc jockey at WKSE in Buffalo, NY has confirmed the radio release of the single via an RCA e-mail, and they generally jump on new songs pretty quickly. There was a suggestion that April 30 was the adds date for it at mainstream radio, but I can’t seem to find any confirmation of it. We’ll have to see if that holds true when some of the trade publications update in the next few weeks. 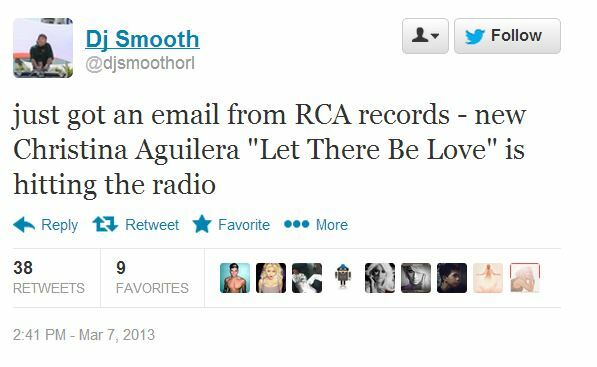 However, that would make sense as to not interfere with Aguilera’s featured appearance on Pitbull‘s still-building single, “Feel This Moment”. It’s approaching the top ten at radio, a level Aguilera hasn’t seen since her 2011 collaboration with Maroon 5, “Moves Like Jagger”. It’s also a big sales hit. “Let” always had the biggest potential, at least in my opinion, to get Aguilera a solo success after several of her leadoff singles crashed out early. In fact, this totally should have started things off instead of “Your Body”. There’s a familiarity to it, sort of combination of Usher‘s “DJ Got Us Fallin’ In Love” meets Nicki Minaj‘s “Starships”, and the lyrics are slightly less explicit and sexually promiscuous as “Body”. She croons, “Let there be love/Here in the dark/Turnin’ me on/Not gonna fight anymore ’cause I want your touch.” Plus, it helps that the vocals aren’t all over the place. Yes, she has her moments where she belts it out, but it’s not overdone to a point where it’s unlistenable. Is it too late to save Lotus or will “Moment” be a launching pad for this song to travel towards the top? I’m really hoping that this can be the smash it deserves to be. With a series of remixes serviced and a bit of buzz building behind it, we’ll see how the summer treats it as it hits the airplay charts. “Love” them? Hate them? Let me know in the comments or on Twitter: @AdamFSoybel.